After a wonderful four months in Outback Queensland performing our new show The Sheep’s Back we are back performing at 12 noon daily at the Cascades Female Factory. It didn’t take long to re-learn our sctripts – the brain is a wonderful organ! We have been very busy taking schools this week – Her Story is so suitable for any age group from Grades 3 onwards. Students love this interactive and informative way of learning about life in the Female Factory. We are excited to be able to offer our wonderful show The Sheep’s Back down in Tasmania. 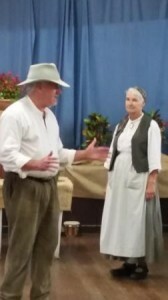 Classic Australian verse from the pens of Banjo Paterson and Henry Lawson plus the fascinating history surrounding sheep and shearing makes a unique entertainment. Perfect for dinner or coach groups and for secondary school students. Tom the Shearer with his wife Kathleen.